It’s been over 2 years since I saw a report on the image of the virgin Mary showing up on a baking tin. It would appear that the phenomenon of virgin spotting, for the good of the Catholics among us, is still alive and well and has now spread (once again) to Ireland. 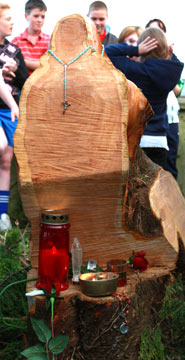 And now home to a newly appeared virgin Mary in, of all places, a tree trunk. She “appeared” after someone had cut down a willow tree. Instantly spotting the holy virgin mother, he dutifully fell to his knees and proclaimed it a true picture of “our blessed lady”. This sort of thing obviously stops all further tree clearance. In fact, almost 2,000 people have signed a petition to prevent the stump’s removal and hundreds of worshippers have been gathering to recite decades of the rosary and light candles. Remarkable. A few hundred years ago, anyone dancing and worshipping round a tree would have been burned at the stake by the catholic church for witchcraft. Times have changed. The 2,000 faithful petitioners have little backing from their local priest though. Again, remarkable. Go into any catholic church and you will see idols all over the place. They are called statues of the virgin. Maybe this one just isn’t fancy enough for this particular priest. Memories of Monty Python’s “Life of Brian” come back to me as I picture 2,000 good Irishmen pointing at this upstart priest and yelling, “Unbeliever!”. …while the official response is a little more, how should I say, guarded? Now that is truly awesome. The church wishing to “avoid anything which might lead to superstition”. A bit of an oxymoron if ever I heard one. This entry was posted on July 10, 2009 at 11:13 pm	and is filed under Generic. You can follow any responses to this entry through the RSS 2.0 feed. You can leave a response, or trackback from your own site. You see what I mean about common sense.